It is an insert and a delete from an index organized table consuming 30,780 and 22,117 Buffer Gets per execution respectively. I wished, at this step, that Oracle has already managed within its last release, to add the predicate part of the above execution plan taken from AWR (and for real time monitored SQL). But It still doesn’t include them. When deleting from the TABLE_IOT, Oracle is not using the primary key. It is, instead, visiting the secondary index which has been created to cover the deadlock threat when deleting from a parent table this index organized table is referencing. Well, just by looking at the above index definition I was tended to think that if the developer has read my Indexing Strategy – Part I article he would have certainly not created that index on the foreign key and would have reversed the primary key index columns by putting the IOT_ID column at the leading edge of this primary key index. As such, he will have succeeded to cover the FK lock threat and would have save disk space and DML overhead on the underlying table. Scanning the primary key index necessitated more consistent gets than it was the case with the previous secondary index child_iot_fk_i. This is due to the skip scan path. Very often when I see an index skip scan access I am pretty sure that there is a place for a better index to be designed. And particularly in this case, where, if I was the developer of this application at design time, I would have started the primary key index with the IOT_ID column and hence would have not created the redundant child_iot_fk_i. The number of consistent gets and the number of recursive calls has been drastically reduced when using the new appropriately designed unique index. However I would have preferred, in this particluar case, a solution in which the type of table would have been changed from an index organized table into a heap table. A proposition that was not been accepted by the customer. I tried to model this customer size using the below table model but did not end up with the exact same situation. Bottom line : think carefully when you have the intention to create an index organized table on how you are going to access it. If you are going to visit this table without its primary key then you might encounter a high number of logical I/O consumption particularly when you visit this IOT table using a secondary index (as it is the case in the current issue). 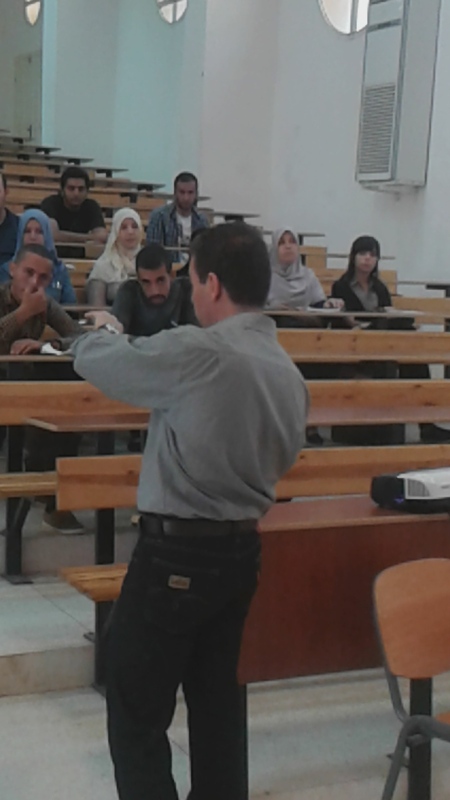 As you might have already guessed I am deploying a lot of efforts to help Algerian universities and companies using the Oracle technology in the same way as the way I’ve used to learn from world Oracle experts like Jonathan Lewis. 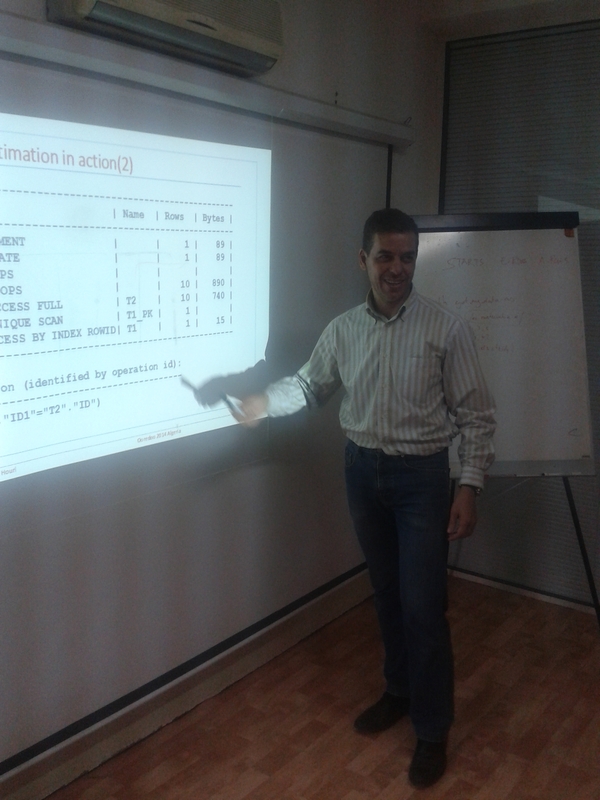 In this context, I spent the last couple of weeks in Algeria giving one day seminar to the Oracle DBA team of Ooredoo – Algeria, a private mobile telephone group and one of the PSG football team sponsors, about interpreting execution plans, adaptive cursor sharing and gathering adequate statistics. I managed also to initiate students of the “Mathematique-Informatique” department of Université de Khemis-Miliana to the Oracle world via a brief and very quick training on how Oracle manage internally to answer a simple select * from employee table (library cache, buffer cache, logical read, physical read, bind variable, soft parse, hard parse, parent cursor, child cursor). I was very happy to see students interested by this presentation which they have never been given in the way I have managed to do it. I made a big effort in order to use words that are close to the student’s actual knowledge of the Oracle Database technology. Strange enough why academic teachers can’t give attractive and elegant training with which I am sure they will initiate so many excellent Oracle carriers. Am I insinuating that to be a good Oracle teacher you should have a good Oracle professional experience? I am afraid that the answer is YES. During the last week I reached the number 100. There are 100 persons following my blogging activities on October the 24th. It was, and it still is, a personal documentation purpose that paved the way to this writing activity. My initial motivation has nothing to do with that number while it becomes now, I have to confess, a magnificent boost. I will be very happy to receive your critics and corrections. Almost a year ago I trouble-shooted a query performance issue which was mainly due to a high number of logical I/O consumed by a local non prefixed index accessing a range partitioned table without eliminating partitions (partition range all). This trouble shooting issue paved the way to the partitioned index: global or local article via which the designer of the “culprit” index has perfectly learnt the lesson. Don’t be disturbed by this internal_function which pops up because of a particular use of an ‘or’ clause in the current query (this is not the goal of this article). However, spot the number of partitions scanned by Oracle when visiting the index local_n_prefix_index: 367 partitions. The whole partitions have been scanned. The Real time SQL monitoring of the corresponding sql_id shows also that 80% of the wait activity was due to the operation with id n° 4 above. This is exactly the same issue as the last year one. Isn’t it? Me: do you remember our last year discussion about non-prefixed index used to drive a query which is not eliminating partitions? Me: So where does this partition list all operation is coming from? A careful look at the table and index definition reveal that the table is indeed partitioned but this time the developer decided to use a virtual column (derived from col3) as the partition key. He also managed to create a local prefixed (at least he was correctly thinking that this is a prefixed) index using col3 column. At this stage of the investigation I remembered that Jonathan Lewis has blogged about partitioning using virtual column where I have already presented (see comment n°3) a similar case to what I have been, coincidentally, asked to look at the last week. Quiz: if you create a virtual column as trunc(date_col,’W’) and partition on it – will a query on date_col result in partition elimination? Is of course valid for the trunc SQL function, but it seems, however, not extensible to other SQL functions. No partition elimination and 365 index range scans. It is interesting to note that when using an index, Oracle applied the predicate part while when full scanning the mho_log_entry table is didn’t . And both explain plan and actual execution are showing the same behaviour.